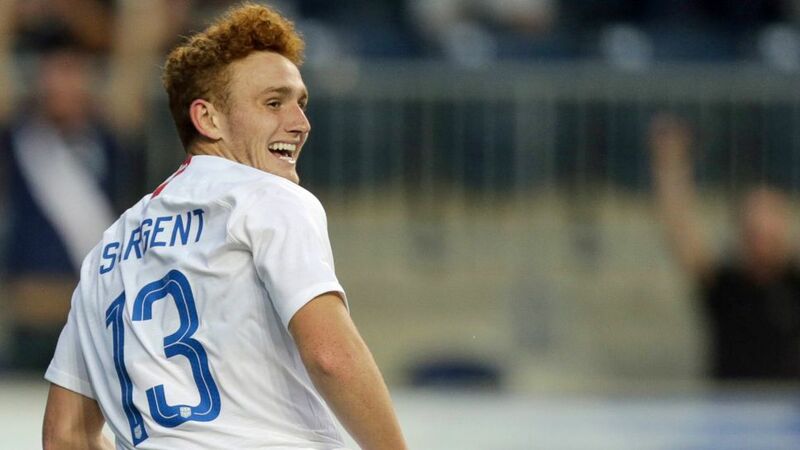 Werder Bremen striker Josh Sargent is yet to play in the Bundesliga, but that could be about to change after the 18-year-old's debut goal for the USMNT. In September 2017, Bremen announced they had reached a deal with Sargent, who would sign a professional contract at the Weser Stadium on his 18th birthday. The rising American star thus put pen to paper on 20 February 2018. "We are extremely happy that, despite the numerous offers from other top clubs in Europe, Josh was convinced by our philosophy at Werder and that we can now oversee his development as a player and support him along the way,” Bremen’s head of scouting, Tim Steidten, said of his team’s impressive capture. Watch: Top ten American Bundesliga goals! Born in Missouri to former college soccer playing parents, the 6'1" (1.85m) forward – who was also a keen basketball player – later impressed on the high school playing fields. Following a move to Florida as part of a USMNT residency programme, Sargent rose to become his nation’s second ranked player within his age group. Sargent was quick to take to the international setup, receiving a call-up to the U14s in 2013 before making it to the U15s later in the same year where he formed part of the team that took part in the International Friendlies series. The American would later go on to score four goals and give two assists as the young Stars & Stripes were junior series winners in 2016. His career now progressing at a rapid pace, Sargent was given a feel for European football when he enjoyed a week-long training camp at Dutch side PSV Eindhoven, before taking part in a similar set of workouts at Bundesliga giants Schalke. Scoring five goals in five games at the U17 CONCACAF Championship helped the United States to a second-place finish and ensured their participation in that October’s FIFA U17 World Cup in India. A call-up for the national team’s final squad for the FIFA U20 World Cup that took place last May ensued. Sargent excelled at the South Korea showpiece, scoring four times to equal the best tally at an U20 World Cup by a U.S. player. Sargent’s double in the opening draw against Ecuador saw him become the youngest player in U.S. soccer history to score at a FIFA U20 World Cup. Despite his best efforts – his four goals winning him the tournament’s Silver Boot – the young striker couldn’t prevent Tab Ramos’s team succumbing to Venezuela at the quarter-final stage. The FIFA U17 World Cup in India followed, and Sargent’s presence as captain meant he became only the second American player to feature at both U20 and U17 World Cups in the same year – Freddy Adu having previously managed to do so. The O’Fallon native struck three goals at the tournament, his last coming as the U.S. were knocked out at the quarter-final stage by eventual champions England. His tally of seven youth World Cup goals also matched Adu’s 2007 record. What Sargent has achieved that no other U.S. player has before him, is to feature at the U17 and U20 World Cups and receive a senior international call-up to the USMNT all in the same calendar year. Although injury would eventually prevent Sargent from appearing in the senior team’s 1-1 friendly draw against European Champions Portugal, the Bremen youngster seized his next chance, scoring on his USMNT debut in a 3-0 friendly win over Bolivia on 29 May. No wonder Sargent is the reigning U.S. Soccer Young Male Player of the Year! Next on the menu is the promise of building a career in the Bundesliga and emulating the likes of Borussia Dortmund's Christian Pulisic and Schalke midfielder Weston McKennie. Given head coach Florian Kohfeldt's recent words of encouragement, Sargent's big break could be just around the corner. "I have other priorities in the transfer market, and with Johannes Eggestein and Josh Sargent we have two forwards that are ready to kick on," teased Kohfeldt in May. Watch this space!